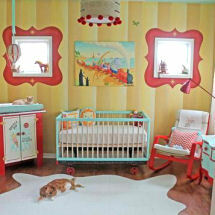 From playful monkeys to polka dots, we have lots of brown and green nursery ideas to share! 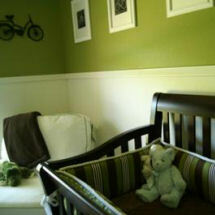 Stick around and you will quickly see that brown and green nursery decor wears many faces! There are many themes that are tailor-made for this earthy color combination and we’ve got the baby nursery bedding sets to prove it! Stripes and polka dots but in a world of designs why should we limit ourselves? Stars, geometric squares, rectangles, paisley and even five-pointed stars might play a role in our brown and green nursery ideas. After decorating an adorable baby boy nursery with a brown baby bedding set that featured large, hound's-tooth print fabric in chocolate brown, I'm convinced this versatile color scheme can handle just about any pattern. 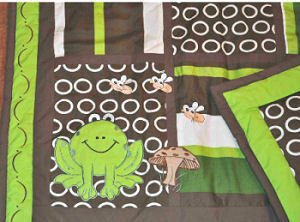 There are many ways to decorate with brown and green in a baby's room and not all are woodsy or forest themed. The color scheme lends itself well to many popular nursery themes for baby boys and girls including both vintage and modern themes. Even when developing brown and green nursery ideas for as common a themes as a jungle nursery, we have options. 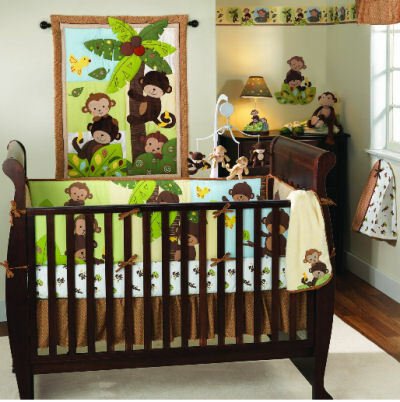 Would you prefer your earth tones to showcase elephants, giraffes or our all time favorite, monkeys? You may think that chocolate brown elephants is stretching things a bit (oh please, I've decorated plenty of baby's rooms using pink, blue and even purple elephants) but when you see a couple of elephants appliqued on the quilt of a brown and sage green nursery bedding set, I know that you'll be every bit as hooked as I am! Forget the African safari, these green and brown nursery ideas will bring the decor a little closer to home. A natural woodsy theme with whitetail deer, elk, moose and a squirrel and raccoon or two for good measure is perfect for these colors. Hunters as well as military personnel can’t get enough of Mossy Oak camouflage baby bedding in their brown and green nursery ideas. And who can blame them when you see how lovely it looks in the baby's crib? I hope that these brown and green nursery ideas will have given you some baby nursery ideas and paint color recommendations that you might consider for your baby's first room. One more tip that I would like to share is that if you are decorating the nursery in green and brown for a baby girl, you may want to experiment with celery or lime green to brighten the decor and make it more feminine. In my opinion, earth tones are gender neutral but I would save the dark shades for baby boys and rooms with lots of natural light.